Carnarvon Broadsheet: Stereo Aids - Manufacturers of Mirror and Pocket Stereoscopes. Publishers of 3D Imagery. Intensive Agriculture In Carnarvon W.A. 1:100,000 A3 size topographic map. 1:10,000 A3 size vertical aerial photo mosaic. 1:250,000 A4 Landsat MSS satellite image. 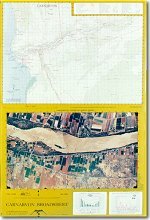 2 Oblique aerial photos showing irrigation area. 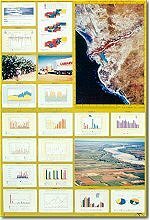 16 colour graphs (pie, line, vertical & horizontal columns, 3D columns, climate, high-low, area) to show various aspects of mixed crop and livestock farming and the impact on the environment. 2 ground photos showing various activities. Included with the broadsheet are five sets of questions and excercises covering skills in map reading/analysis, photo interpretation and graph analysis. An answer sheet is available.